Executives from Filtration Group and it’s three Buffalo-based companies--Buffalo Filter, Multisorb Technologies and Air System Products--unveiled emerging technologies and active plans for employee recruitment at a press conference on August 21, 2018. Following the announcement of the recent acquisition of Multisorb Technologies and the earlier additions of Air System Products and Buffalo Filter, Filtration Group has further expanded its portfolio in life sciences, healthcare, medical and an array of industrial markets. Filtration Group now has more than 7,200 employees across 28 countries and an annual revenue of more than $1.5 billion. The products being designed, engineered and manufactured by the three Buffalo-based companies are broadening Filtration Group’s capabilities to serve its customers with an unmatched depth of expertise in diverse market segments. “Filtration Group continues to look for ways to make the world safer, healthier and more productive,” said Mike Ellis, Chief Human Resources Officer for Filtration Group. “All three of our companies in Buffalo Niagara are committed to those same values as evident by the hard-working people who are employed at these facilities and the technologically advanced products that are being manufactured here. 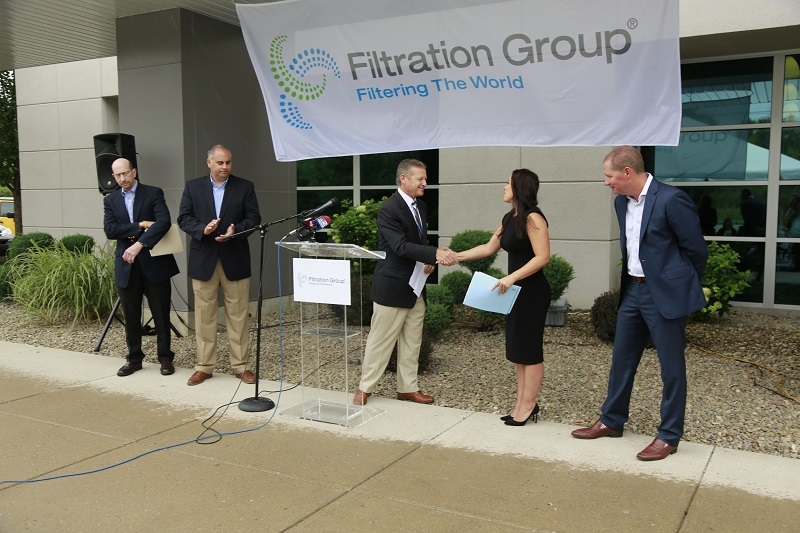 For the Buffalo Niagara community, the investment by Filtration Group strengthens Western New York’s growing distinction as a tech center and enables the companies to have greater reach across the globe while still retaining local roots. The series of acquisitions is representative of Filtration Group’s pattern of breathing new life into local economies and identifying companies that are trailblazers within their industries. The companies promoted their range of employment opportunities for as many as 60 new positions and exhibited cutting-edge products featured in an “Innovation Station.” For the biomedical market, Buffalo Filter showcased how its surgical smoke evacuation technology protects patients and medical staff from the damaging effects of smoke emitted through operating room equipment. In life sciences, Multisorb introduced its new developments in active packaging technology, including sorbents that use organic materials to preserve quality and freshness of pharmaceuticals and food and beverage products. For industrial markets, Air System Products also presented its condensate drains and oil/water separators that help reduce oil discharge from compressors and ultimately allow for more eco-friendly operations.